The Toxi-ChromoPadTM bioassay uses a novel mutant of the bacterium E. coli as the test organism. This bacterium was selected specifically for sensitivity to a wide range of toxic substances and is well adapted for acute sediment toxicity testing. The Toxi-ChromoPadTM kit is a bioassay screening tool used to determine acute toxicity in soils, sediments, sludge or other solid waste material directly without extraction. Each kit contains all the reagents and disposable materials necessary to test at least four samples, including dilutions and controls. Disc 1(center dot is a control) A series of 8-2 fold serial dilutions were carried out on the pad ranging from pure sludge to less than 1%. At a concentration of 0.8% the sample showed no toxicity. Disc 2 – The same test carried out on a different sludge sample. 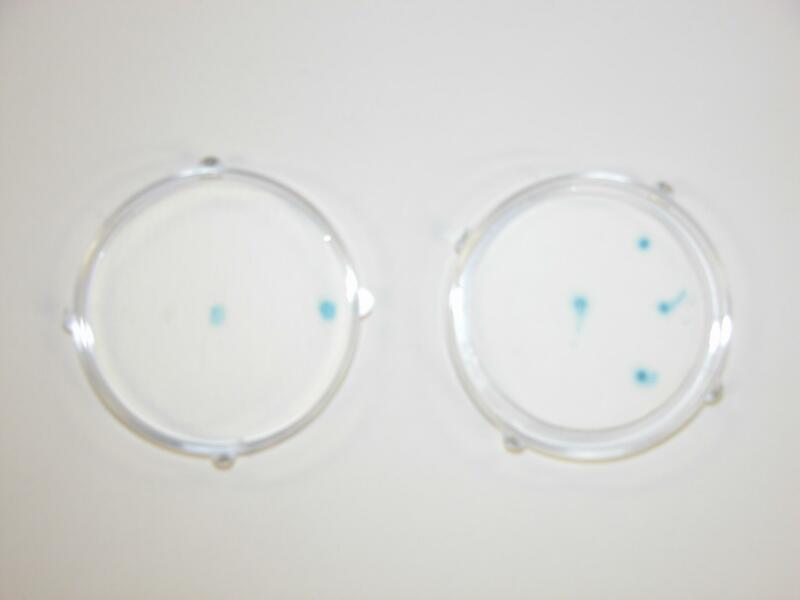 In this case toxicity disappeared at a 6% concentration showing this sample was 10X less toxic.